I was not as productive in May as I would have preferred. I had to travel quite a bit and was generally busy with my actual responsibilities! I still managed to get in a few nights of work. I tried out my new Zero Paints pink primer. I learned a little too late that “thinned for airbrush” doesn’t mean the same thing to everyone. After fighting with spitting and poor coverage, I thinned the mix and finally got the flow I was looking for. The only problem I ran into was heavy spitting on the engine cover of the F40. It filled in the embossed F40. I decided to strip the engine cover and start over. Beyond that, I started the interiors for the Alfa Romeo and the 70 Superbee. The chassis pan for the Alpha is also the bottom of the interior. I first finished the chassis in body color then worked on the interior itself. I flocked the interiors of both cars and prepped several parts. I needed to fill gaps and sink marks on several pieces. I filled them with two part filler. I decided to try Pink Zero Paints primer. It needed considerable thinning before it would spray correctly. 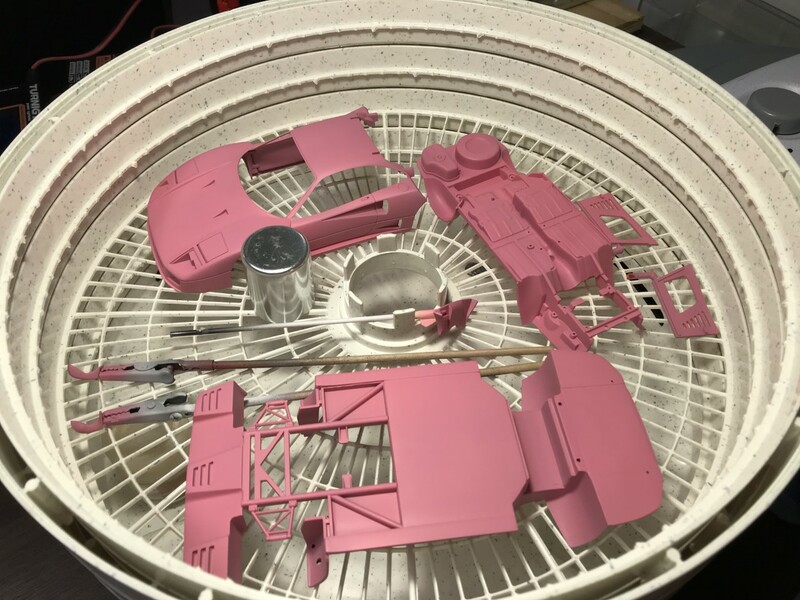 I primed and painted several parts for the AlfaRomeo, Superbee, Chevelle and more. I used Zero Paints semigloss for all of the parts. I definitely like it! I’m really getting the hang of working with Flocking. I love the added depth it gives interiors.